Love it or hate it, Spotlight is pretty much the de facto choice when it comes to searching your Mac’s files. Until today, that is. Google has released a Mac version of Google Desktop, its desktop search app previously available only to Windows users. Google says its search application and OS X 10.4’s Tiger are complements, not competitors. Still, many Mac users dissatisfied with Spotlight might approach this new product with the following question in mind: By bringing Google’s considerable expertise in all things search-related to bear on your Mac, could Google Desktop outshine Apple’s Spotlight? Let’s take a preliminary look at this application, which you can download for yourself, provided you’re running Mac OS X 10.4. You can summon Google Desktop’s search window by hitting the command key twice in quick succession. (That keyboard shortcut can be changed in the preferences.) Typing a query in the text box will display a live list of results, much as Spotlight does. In my informal tests, Google Desktop seemed zippier than Spotlight, showing results with little or no delay. Google Desktop easily lets you use powerful search operators to narrow down your query. Google Desktop will match searches against files, e-mail messages, addresses, and chat transcripts—by default, the application will display the first ten results but you can shorten that to the first five or expand it the first 15 via Preferences. An icon to the side of each result lets you know the type of file you’ve found and its associated application; selecting any result from the list will open that document in the associated application, just like in Spotlight. For example, if I do a search for “Apple” and click on an e-mail result labeled “Apple eNews,” that e-mail will open in my default e-mail client. At the bottom of the list there’s an option to display all results from your desktop or search the Web with the same string; selecting either of these options will open your default browser and call up the appropriate results. Among the most powerful options Google Desktop brings is the caching of deleted files. If you accidentally trashed that report you need for tomorrow’s meeting, you may still be able to recover the content via Google Desktop. Like Spotlight, Google Desktop builds an index of your files to enable quick searching. Google Desktop’s preferences, which are installed as a preference pane, allows you to choose which volumes are indexed and whether or not you want your Gmail account and web history indexed as well. Indexing begins as soon as you install the application, and while I didn’t notice a substantial slowdown in using Google Desktop, I did notice that the fans on my MacBook kicked into action. A quick check of Activity Monitor showed the indexing processing taking anywhere from 15 to 85 percent of CPU cycles during the initial procedure. 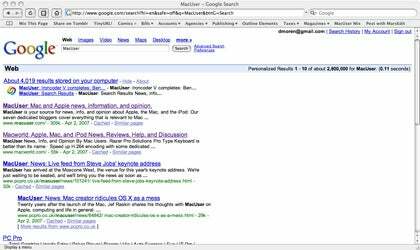 By integrating with Google.com, Google Desktop can return results from your Mac whenever you use search on Google. There’s also an option to integrate Google Desktop with Google.com. Once enabled, whenever you search for anything on Google.com, you’ll also be alerted to how many results appear on your own machine. Google says that these results are kept private (even from the company), but you can disable this functionality in Google Desktop’s preferences if you choose. Since Google Desktop is not drag-and-drop and it doesn’t use Apple’s standard installer, there’s no information about what files are being installed and where. Google Desktop does offer an option for uninstalling via the preference pane. Also, though Google Desktop offers an option of whether or not to display results from deleted files, disabling this option does not prevent those files from being cached—it merely hides the results. Those users who work with sensitive files should be aware of this fact. Naturally, this being a Google app, Google Desktop is still in beta, but in the brief time I’ve used it, I’ve experienced no problems. While it may not offer the same level of integration into the OS that Spotlight has, it seems a more than able competitor when it comes to the nitty-gritty of searching your Mac. Macworld will have a full review of Google Desktop as we get more of a chance to put the application through its paces.